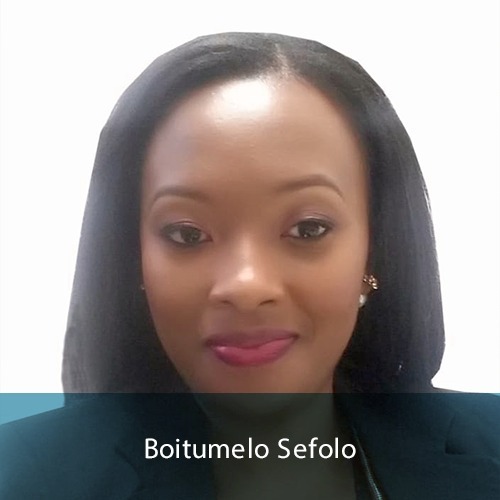 Boitumelo Sefolo is a Clinical Psychologist with an extensive experience in treating psychological conditions. Through various intervention models, she offers a holistic approach to intervene in the lives of those experiencing dysfunction. As a family systems oriented therapist, she views persons in the context of relationships. She believes that relationships determine the quality of the person’s life. That is, if one experiences relationships in early life that are unpleasant, they might leave one feeling unfulfilled and stuck in hard to break life patterns. These patterns tend to increase one’s feelings of isolation, anger, resentment, misery and anxiety. Without relevant support and interventions, these are likely to lead vulnerable individuals to suffer depression, anxiety, adjustment difficulties and other mental illnesses. Boitumelo Sefolo has 11 years’ experience as a Clinical Psychologist. She is passionate about health issues relating to bereavement / loss, trauma, coping with medical conditions, adjustment difficulties, mood disorders (Bipolar and depression), anxiety disorders and relationships. She provides therapy to individuals, couples and families, and in her 11 years of service she touched over 8000 lives through psychotherapy. Extensive services allied to her psychological work include; conducting neurological assessments to identify and manage neuropsychological illnesses due to injuries, work incapacity assessments, as well as medico-legal assessments to determine impact of personal injury into future functioning. She lectures Psychology and regularly speaks on topical conversations through television, radio, magazine and articles. Furthermore, she engages in public speaking platforms to discuss various psychological issues to edify the public. She regularly attends conferences to keep abreast of new developments with specific interest on evidence-based research interventions in the field of Psychology. She frequently travels internationally to gain wide exposure into global health systems, models and facilities. Individual Therapy assists individuals in a unique and personalised process to achieve personal fulfilment, growth and enhance their capacity to experience the best version of the individual as the masterpiece they are created and deserve to become. Couple’s Therapy helps to enhance fulfilment in relationships by addressing underlying issues that are impediments to a solid relationship. Family Therapy deals with family pain and creates a safe environment whereby family members discuss areas of conflict and develop a way of maintaining healthy relationships. Boitumelo Sefolo trains community parents in Parenting and Psychoeducation Guidance. This process assists them to raise from childhood into adulthood, children that are well adapted, enhanced in their potentials, independent and balanced in life. Families across a wide range of cultures are experiencing various relationships and wellbeing challenges, more so with the learning of new skills. Through the program, children with behavioural difficulties are empowered to find their voice and equipped with effective tools to navigate through life changes and challenges. Families experiencing divorce are assisted to facilitate cooperation between members and delineation of roles to safeguard the interest of children, while blended/mixed ones are empowered to make optimal relationship adjustments to hold together.